There is no standard treatment strategy for patients with extensive-stage small cell lung cancer (SCLC) who have failed two or more prior chemotherapeutic regimens. In this study, we retrospectively evaluated the efficacy and safety of apatinib in patients with extensive-stage SCLC after failure of more than second-line chemotherapy. 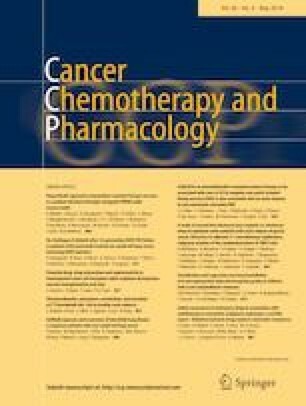 A study group comprised of 22 patients with extensive-stage SCLC after failure of more than two prior chemotherapeutic regimens was given apatinib orally at an initial dose of 500 mg daily until disease progression or unacceptable toxicity. This study was analyzed according to the National Cancer Institute Common Toxicity Criteria for adverse events (AEs) and Response Evaluation Criteria in Solid Tumors (RECIST) for response assessment. Between August 30, 2015, and May 26, 2017, 22 patients were enrolled for evaluating the efficacy and safety of apatinib. Among them, 12/22 (54.5%) underwent dose reduction during treatment. Up to July 31, 2018, the median progression-free survival rate was 135.0 days [95% confidence interval (CI) 63.8–206.2]. According to the RECIST criteria, the disease control rate (DCR) was 86.4%, 19/22 [comprised of partial response (PR) 18.2%, 4/22; and stable disease (SD) 68.2%, 15/22 patients]. The most frequent AEs were hand–foot syndrome (45.5%, 10/22), secondary hypertension (45.5%, 10/22) and fatigue (40.9%, 9/22). The primary grade 3 or 4 toxicities were hypertension (22.7%, 5/22), hand–foot syndrome (13.6%, 3/22), and proteinuria (9.1%, 2/22). Apatinib exhibits modest activity and acceptable toxicity for patients with heavily pretreated extensive-stage SCLC. Hui Li and Jian Zeng are co-first authors. This work is supported by Grants from the National Natural Science Foundation of China (31500705), the Natural Science Foundation of Zhejiang Province (LY15H160006, LY17H160040) and Zhejiang Medical technology program (2016KYB035, 2016KYB037). All procedures in this study involving human participants were performed in accordance with the ethical standards of the institutional and/or national research committee and with the 1964 Helsinki Declaration and its later amendments.